I heard those words often when we lived in Brooklyn, NY in the 1940s. It was my mother sending me around the corner to Abie’s appetizing store. They usually were followed by a request for some bagels and cream cheese for Sunday breakfast at the Levine’s. Now, all these decades later, mom’s words may help settle the confusion that surrounds the question of whether there is a difference between lox, smoked salmon and gravlax. It’s a question that has nettled me for many years. Countless times I’ve seen menus offering “smoked salmon with tomato, onion, capers, bagel and cream cheese.” If it’s lox, I wondered, why don’t they call it lox? When I order it, I get lox. Could it be some restaurant owners think non-Jews won’t know what lox is? Come on. Bagels have crossed the ethno-cultural divide, why not lox? I had lunch with someone who ordered a bowl of chili and a bagel at a quasi-deli some 20 years ago. When I visit the main plant of Western Bagel about a mile from our home, the vast majority of customers and virtually the entire sales staff are Latinos. I’m offered bagels at restaurants in England, Scotland, Ireland, Italy, and even France, the nation that give the world baguettes. The whole thing came to a head during my recent golf trip to Scotland. Every menu included “smoked salmon” and every breakfast buffet and airport lounge offered “smoked salmon” at the display of lovely pink-colored fish. At every opportunity, I tasted what my well-trained pallet knew was lox – soft, oily, slightly-salty, thin-sliced, cured salmon. You can’t fool this transplanted kid, who grew up eating in delis in Brooklyn and has easy access to the delis of Greater Los Angeles. If it looks like lox and it tastes like lox, then it must be lox, no matter what it says on the menu or buffet table card. And lox is not smoked anything. Lox is cured salmon. At first I thought it might have something to do with how they market lox to Scots. But, no, that couldn’t be it because the hotels at which we were staying catered heavily to tourists. If all those eating establishments are concerned people will not recognize the item as fish, why not print on the identification card: Lox / cured salmon. Those same buffets have no trouble calling a bagel a bagel instead of something like a bread roll with a hole or a boiled bread roll donut. This phenomenon is not restricted to Scotland, or even the rest of the United Kingdom. You can find the smoked salmon label on lox in France, Canada, Italy and throughout large swaths of the United States. Two weeks after we returned home, I had a breakfast meeting at a coffee shop in Hollywood. Sure enough, the menu offered “smoked salmon” with all the fixings. It happened again this weekend at breakfast at the Omni La Costa Resort in Carlsbad, CA. It makes no sense. Both lox and bagels owe their origins to the same roots in Jewish culinary culture. If a restaurant patron knows a bagel from a donut, why would he or she not also know the difference between lox and smoked salmon? Visits to Google and Bing don’t help. Both cite articles in reputable food magazines that claim lox can be made only from the belly of the salmon. “Not so,” said Ronnie Peskin, owner of Brent’s Deli in Northridge, CA, which has been proclaimed by many as one of the best, if not the best delis in the nation. So, here’s where mom’s old directive comes in. If lox can come only from the belly of the salmon, why would she have to specify that she wanted belly lox. Another thing prevalent on the internet maintains that lox is cold smoked after it is cured so the smoking doesn’t cook it but gives it a slightly smoky flavor, but smoked salmon is hot smoked. Various internet listed articles also try to make the case for the difference between lox and Nova lox. The aforementioned Ronnie Peskin has been in the deli business for something approaching 60 years. He started as a counterman at a deli owned by his uncle and then worked at several other delis before buying his own small place in 1969. To this day, he is onsite at his deli every day, greeting customers, overseeing the food preparation and directing the kitchen in making virtually everything in the store. The bar-b-que cod is made onsite, but the lox is sourced from outside. When asked about the great lox vs. smoked salmon question, Peskin said the only thing that really is smoked salmon is the stuff smoked over wood and sold in cans or packaged. He poo-poos the notion that the stuff that looks like lox but sold as smoked salmon is anything other than lox by another name. In his own shop, he says, he no longer differentiates between lox and belly lox. We slice the fish so every piece has some belly in it. The only parts of the fish not served as a sandwich or on a plate are the front and the tail, which Peskin says aren’t good enough so they are chopped up to make lox and eggs and onions or a lox spread when mixed with cream cheese. He thinks the whole smoke salmon thing has more to do with marketing than anything else. Peskin feels the same way about Nova lox. Once upon a time it described lox made from salmon caught near Nova Scotia, Canada. It may once have been prepared slightly differently from regular lox and may still be in some isolated instances. But now, Nova doesn’t mean it’s caught at Nova Scotia and usually doesn’t mean it’s prepared any differently. To my taste, in recent years, I’ve found Nova lox to be inferior to regular lox. Further confusing the market place is the existence of actual smoked salmon. It’s nothing like lox. Any fish can be smoked over smoldering wood, just as any meat can be smoked. All you need is the fish, the wood and a smoker. This process actually cooks the fish. The texture is nothing like lox. The confusion between lox and smoked salmon may be a problem in places like Alaska and the Yukon, where they actually smoke fish in smokers. But in Scottish restaurants and hotels, and in delis and coffee shops in the rest of the U.S., if it says smoked salmon, you can order it and eat it just as you would lox in any Jewish deli anywhere. That leaves us with the matter of gravlax. It’s a Scandinavian version of plain old lox, just cured in a different way. To make lox, the fish is sliced in half lengthwise, coated with salt and laid down to cure. Then the salt is washed off and it’s ready to slice and eat. For gravlax the fish also is sliced in half lengthwise, both halves are coated with salt, dill, and sugar. The two halves are pressed together and laid down with a heavy weight on them to squeeze out more of the fat. The fish is turned every few days to assure even curing. As for all the rest, the stuff sold as Scottish smoked salmon, Norwegian Smoked salmon, etc., just assume it’s a way of marketing something that sounds more exotic than lox and may very well be made from farm-raised fish or inferior parts of the fish. Lox is expensive because it’s such a hands-on process to produce it. Good salmon will run north of $40 a pound. 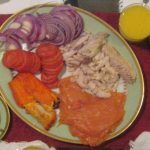 But on the breakfast table at a Jewish household on a Sunday morning, there’s nothing like a platter of lox, sable, sturgeon, whitefish chubs, cod fish, tomatoes, onions, Greek olives, cream cheese and bagels so fresh they don’t need toasting. It may be a Jewish household, but you don’t have to be Jewish to love it. Introduced to Lox, Bagels and Cream Cheese by my Jewish room-mate long ago at UCSB…I fell in love with it at first bite, Louise, not so much….she also gave me all of her Grandmother’s Mandel bread…yum!!!! Her Grandma never knew. And today I know more about Lox and Smoked Salmon than I ever thought possible. My dad (Norwegian, who moved to Canada) made it for 40 years. We just called it smoked salmon. Anything not smoked (like gravlax) or with dill/garlic etc… we called lox. And the other cooked stuff, was called Hot Smoked salmon. Funny enough I tell people now it’s lox, because that is the best way to explain cold smoked salmon. We had lots of requests to supply places in New York, but we just made it for friends and other fisherman. Real lox, just like gravlax, is not smoked – hot or cold. I can’t figure out where the notion of lox being cold smoked originated. But it appears in lots of food magazines. Ask any real Jewish deli owner or purveyor and they’ll tell you lox is not smoked. The difference between lox (the Jewish kind) and gravlax, the Norwegian/Scandinavian kind, is the ingredients with which it is cured. For instance, gravlax is heavy on the dill; lox uses no dill. It’s also in how the fish is laid down after it is seasoned. I just loved this article, Larry! It was informative and helped me understand the differences that I’ve wondered over. I fell in love with bagels when I moved to L.A. from the Bay Area in the early 80s & as a Muppie (Mexican urban professional) worked in DTLA at the One Wilshire Building where the building cafeteria/grill featured a delicious bagel & cream cheese but when I finally tasted real lox & cream cheese bagels with all the fixings I was hooked! Recently I took my daughter to our local bagel shop where the lox are the real deal. She asked me what the difference between lox & smoked salmon was. I told her that lox didn’t taste bbq smoked and was a more natural taste. It was as close to describing the detailed differences as I could get. But I am in awe of your extensive knowledge on the subject & I loved your anecdotal references. I love the Jewish culture, traditions and only wish I knew how to speak Yiddish. If you have knowledge of or have written articles with anecdotes about Yiddish please let me know. I would love to read them! Thank you, Larry. It is always very special to read about cultural traditions from those who’ve lived it and not those who have appropriated it. I will always ask for Lox with my bagels & cream cheese. I’d ask for Belly Lox but I’m afraid few would know what Belly Lox are! Thanks for a wonderful read! I think the best bagels in L.A. are from Western Bagel. My favorite lox is at Brent’s in Northridge. The lox at Art’s Deli in Studio City also is very good.